it’s been a while since our last blog entry because we have been super busy with very non-glamorous ‘behind the scenes tiny house work’. basically, what this means is: emails, emails, emails, research, research, research. having accumulated enough news that are worth sharing, we now just want to deliver a quick update on what has been happening in our land of tiny. I want to start with a development that is not only important for us but could be potentially interesting for many other future tiny house builders on this continent. on our quest of finding a suitable tiny house trailer that will fit both our structural and financial expectations, we have found a company that has agreed to build a trailer frame specifically designed for carrying tiny houses. since we have received this offer, I have had numerous discussions with people online and offline in order to come up with a trailer design that will satisfy as many TH builders as possible. this is important because we can only build one basic model for now, which has to suit the needs of many in order to fit different tiny house types and also make its production profitable for the trailer company (which, fortunately, doesn’t involve a very large quantity). we are currently still talking to a number of people from all over europe and would be happy to receive suggestions and/or wishes on how the actual trailer design should look like. if everything goes as planned, it should soon be possible to build european tiny houses on the stable foundation they deserve, rather than having to make them fit to boat or car haul trailers, which are simply never ideal for carrying mobile homes. also, I hope that these developments will inspire other trailer makers to start designing their own products for this newly emerging market. 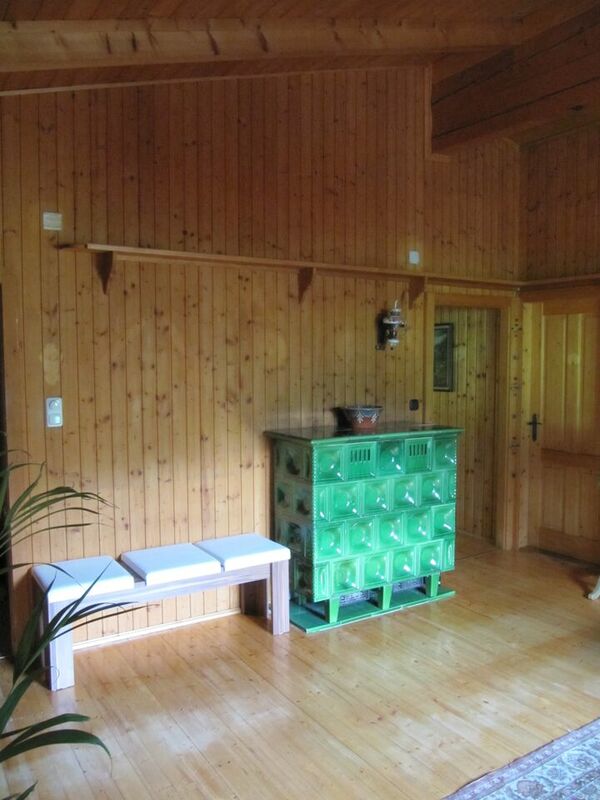 a couple of weeks ago, I got in touch with a lovely austrian lady who was selling 4 wooden windows online. when we got talking, I told her more about our tiny house project and she immediately liked our plan of re-purposing building materials. what came next we definitely didn’t expect: she offered us to recycle her house!! basically, she told us that the reason they were selling the windows was because they were planning on demolishing their current house in order to build a new one. however, since she hated the idea of wasting all of the beautiful building materials, she was very happy to hear about our idea to reuse large parts of her home and turn ‘big’ into ‘small’. as if this wasn’t amazing enough, she then sent us pictures of the actual home, which can only be described as a wooden dream for every tiny house romantic! even though we do realise that it will be hard work, we are quite confident that that we might be able to re-purpose large amounts of wood sheathing, wooden floors, doors, windows and even the wall and roof insulation. we are also hoping to be able to reuse some of the house’s construction wood for our own wall framing. however, because we won’t get a chance to take a look at what is actually inside the walls until they tear it down in spring next year, we can only speculate whether it will be suitable for our ‘tiny haus’. also, I have been told that the process of moving and cutting large amounts of construction wood to size can be both difficult and expensive – and we surely don’t want to open a can of snakes with this. regardless of how many components we will be able to use in the end, this is huge for us! not only will we be able to get our hands on absolutely beautiful building materials, but we can give them a new purpose at the same time and save them from being wasted – something that really means a lot to both of us. we strongly believe that in today’s wasteful society, sustainability should not only involve the usage of responsibly sourced, fair products but also promote longer life cycles of existing goods. in addition to this, we love the idea of not just getting new and shiny things for our house but actually using materials that reflect our passions and bring their own look, feel and story into our new home. the idea of re-purposing old houses when building tiny houses is something that has really sparked our interest and that we will definitely keep looking into. also, we will of course announce any news about the tiny house trailer developments as soon as we have come to a definite agreement with the parties involved. one crucial aspect tiny house builders have to consider when building a house on a movable foundation is the choice of trailer. as this is a topic that has been constantly on our minds since the very beginning of our planning, I thought it might be useful to write about what we have since learned about european tiny house trailers. I believe that one of the biggest challenges european tiny house people are confronted with is weight. since the trailer weight limit of 3.500 kg (as in most EU countries) does not apply to american tiny house builds, it is important to first understand that the countless youtube videos and picture galleries of absolutely stunning tiny houses are often really advertising something that is not feasible on this continent. many american tiny houses are built in a very similar fashion: walls are framed with standard ‘platform framing’ (which uses quite a lot of wood), which are stiffened with relatively heavy OSB plywood boards on both sides, inside and outside wood sheathing are applied to give a house the typical ‘tumbleweed cabin look’, and then they are finished off with beautiful hardwood floors, lots of appliances, decorative elements, etc..
however, a lot changes once a 3.500 kg cap is put on this way of building and many clever decisions and compromises have to be made in order to be able to erect a fully equipped house that will stay under this limit. for this reason, one of the first questions when choosing a trailer should be whether someone can/wants to stay within the weight restrictions of a car-hauled trailer, or go bigger. since the legal weight limit of 3.5 tons on trailers that can be towed by a car (keep in mind, there is only a small number of european cars that can tow such large trailers) might sometimes not be enough for a tiny house builder, there is always the option to switch to a heavier and/or bigger trailer. however, this either means that a special transport has to be arranged in order to move the tiny home or that someone has to acquire a truck driver’s licence and tow it themselves. while a certain loss of mobility and independence might not pose a big problem for some, other’s will not be able to make this sacrifice and rather try to fit their tiny home on a more flexible car trailer. if someone chooses to opt for a car trailer, it will be advisable in most cases to buy a trailer that is built for the maximum weight of 3.500kg, rather than trying to go smaller (please keep in mind that the issues addressed here mainly concern tiny houses longer than 5m and not “micro houses”). if a lorry trailer is chosen, only the sky is the limit and the building possibilities are much larger, at the expense of reduced mobility. since my personal conception of tiny house living is largely built on flexibility and independence from 3rd parties, the rest of this article will mostly cover issues related to tiny houses built on car trailers. when embarking on a 3.500 kg building project, one mustn’t forget to account for the actual weight of the trailer. having compared numerous trailers from different countries of the EU, I estimate the own weight range of car trailers that can carry 3.500 kg to be between 500-1000kg. since every kilo might count in a european tiny house build, the dead weight of the trailer constitutes an important variable in the equation. the weight of the trailer largely depends on the specific type of trailer and its purpose. platform trailers are relatively easy to build on since they offer a flat surface, often even with a pre-installed floor. however, the disadvantage of these flatbed trailers is that the floor is built above the wheel well and therefore located about 56cm above the floor (when using 13′ (inch) wheels instead of 14′ – something I would always recommend). this means that tiny houses constructed on platform trailers will essentially lose about 10 cm of building height in comparison to houses that sit on trailers with their floor built between the wheels. this space can be utilised as valuable head space in/under lofts and can really make a difference in a tiny home that is only about 3.5 m tall. unlike platform trailers, the loading floor of machine transporters is generally built between the wheel wells, which means that an approximate height/lowness of 47 cm can be achieve if 13′ wheels are used. however, since these trailers are built for towing things such as mini-diggers or other heavy machinery, they are often quite sturdy and can take away valuable weight from the tiny house. also, I haven’t yet found any machine transporters that were about 6 or 7 meters long, which makes me believe that they are usually built for shorter loads. since boats come in all shapes and sizes, boat trailers feature a wide range of different models and varieties. in addition, the loading surface of boat trailers is quite flexible, meaning that it is not restricted to a certain height and often built between the wheel wells. 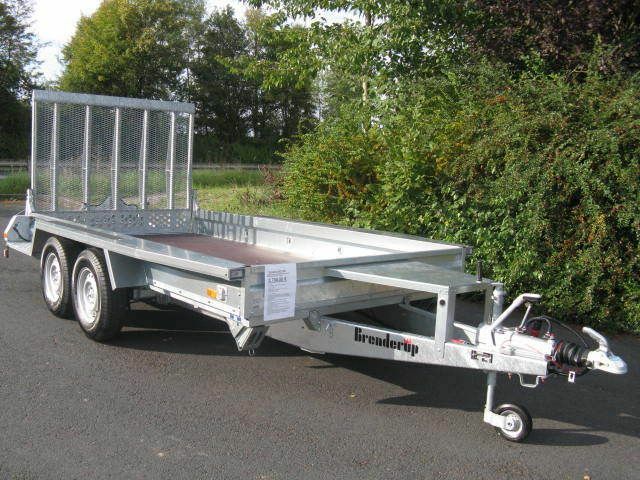 the downside of these trailers is that they generally have special boat-carrying mechanisms welded onto the frame, which first have to be taken off in order to create a suitable surface for a tiny house. besides the option of re-purposing a trailer, it is of course also possible to order a custom-made tiny house trailer at a trailer manufacturer. I think that this is a great option for people who want to have a trailer that will fit their build perfectly and have a few thousand euros more in their trailer budget. 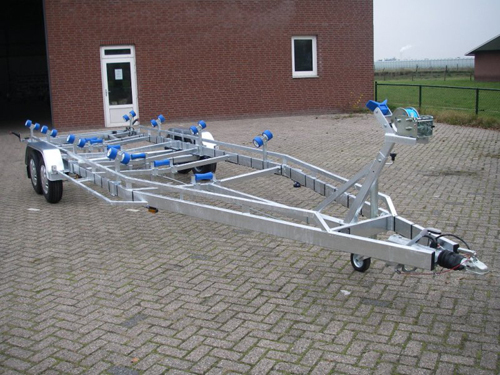 the cheapest custom trailer I have so far been offered in Austria was 6100 euros, while I found brand new boat trailers in the Netherlands that go for around 3500 euros. considering this relatively large price difference, I would say that the decision of whether to get a prefabricated/used or a custom-made trailer really depends on the budget of the tiny house builder. I have seen 8 meter long trailers that only weigh around 500 kg, which would leave an amazing 3000 kg for the actual build. rather than having a fancier trailer, I would always opt for more building weight. the lowest trailer floor height I found so far was 470 mm (measured at the upper edge). I was told that theoretically it would be possible to build it even lower, which might, however, result in problems when encountering speed bumps and other road obstacles. the trailer should ideally be designed for 3.500 kg and offer an even and overall suitable surface for the construction of a tiny house, while not exceeding a reasonable price range. 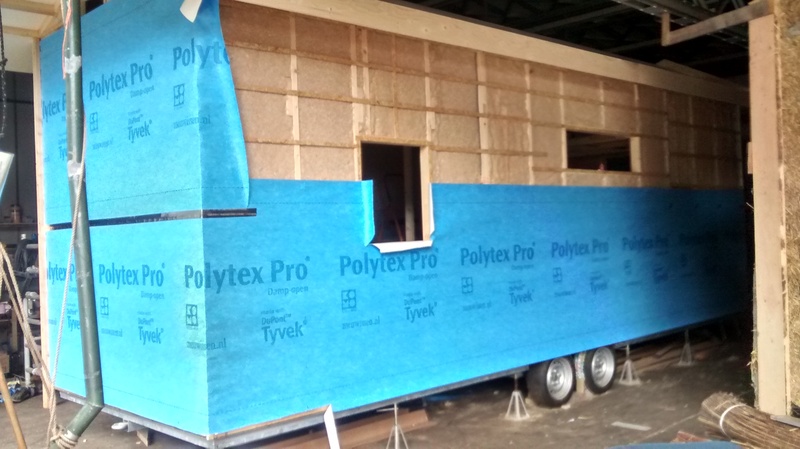 until trailer producers will start producing prefabricated and standardised tiny house trailers (which will be quite soon, I am sure), the price of custom-made trailers will stay relatively high due to the extra costs of individual registrations and inspections. there it is, this is how far we’ve come in our trailer research so far. we hope that this will facilitate the decision process for some tiny house builders out there and we would be glad if other people contribute to this discussion, bring in new ideas and share their experiences. right from the beginning of our tiny house planning maria and I knew that we wanted to incorporate used materials in our future home. since both of us try to produce as little trash as possible in our everyday lives, not buy any plastic and re-use and recycle as much as we can, it was clear to us that our ‘tiny haus’ should also represent this lifestyle. therefore, a while ago we started scouting online second-hand platforms in search of hidden treasures and since then we have learned quite a few things about second hand building materials, which we want to share with the TH-community. the first (and most important) key to finding good second-hand materials is quite simple, yet often hard to get: time. unfortunately, a crucial part of getting great used stuff is waiting for it. luckily, for us this is not a problem since we know we won’t start our actual build before summer next year, which means that we will have over a year to gather building materials, furniture and technical gadgets. however, once ‘time’ is deleted from the tiny house equation and things are needed on the spot, it can get quite tricky to find good re-usable items and buying new components can quickly add a lot of financial weight to a build. in addition to an appropriate timeframe, a crucial skill for every online treasure hunter is to know where and how to look. here, we discovered that even though the internet is scattered with second-hand sales pages and there are many great sites, what was a proper game-changer for us were the ones that offer so-called ‘search agents’. this smart function offers users to precisely define certain search parameters and notifies them whenever new items appear on the page that fit these criteria. using this function essentially meant that we could stop looking for stuff, stop wasting countless hours online and simply wait until we would receive email alerts. when I began doing this, I set the search parameters quite loosely in order not to overlook anything or potentially miss out on something amazing. since then, I have realised that getting 12 different mail alerts, suggesting 87 items per day actually achieved the opposite of what I had intended, since I started getting annoyed by the alerts and stopped looking at the items closely. therefore, I narrowed down all my seach criteria to very specific models, their location and price, which meant that I would only receive 3 “beeps” per day on my phone, but that they would always get me really excited. thirdly, I think it is very important each future tiny house owners to define for themselves which materials can be bought second-hand and which should be new. this is a point where the opinions among the TH community diverge greatly and where there’s simply no right or wrong. while some aim at building tiny houses for under 5000$ and use mainly recycled components, others will want to build their new homes using new products only. for me and maria, the only concern we had in this regard was safety and stability, which led to the decision to buy new wood for the construction of our house frame, roof and subfloor. 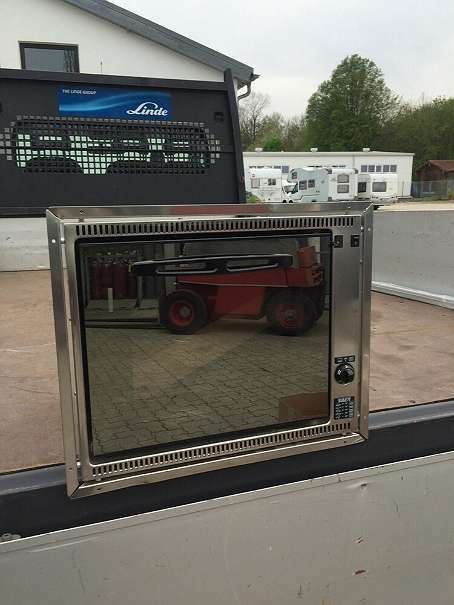 also, we will most likely invest in a new trailer for our ‘tiny haus’, which is not really connected to the safety issue but the simple reason that the specific trailer we are looking for is very hard to get second-hand. apart from these few components, we aim to provide a new home for as many used materials as possible. 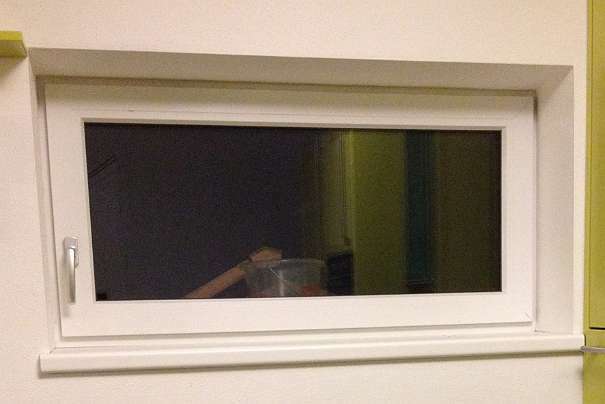 after having found our first tiny haus family member – this beautiful window that will lighten up our sleeping loft – a couple of months ago, we bought an amazing unused propane oven only a few weeks later. 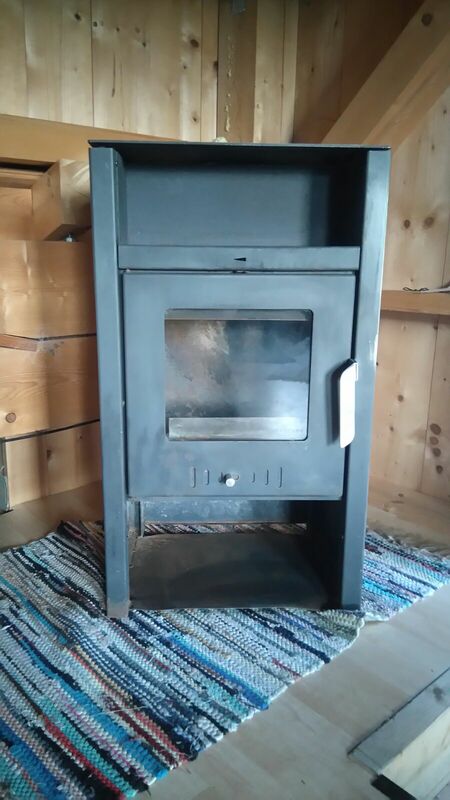 on top of this, last week we hit the jackpot when we found this beautiful wood burning stove for 50€ (amazing!!!!!! ), which will keep us warm all year long and become the heart of our house. I guess the moral of this story is that if you want to find inexpensive recycled materials for your house, it is really important to give yourself time and start the planning early enough. also, I would advise anyone to keep in mind the impact that used materials can have on the design of a tiny house. after all, it can happen that some extraordinary item can cause someone to rethink their initial plans and inspire them to go a new way with their build, which can be very exciting and better than trying to find the ‘perfect’ materials for a predetermined design. for us, re-using materials is such a rewarding process, we love being able to give a second life to things, we try to let each of them inspire us, add its own story to our home and transform it into a place of warmth and connectedness. I want to end this post with some other really exiting news. last week, my dad sent me this picture, telling me that a relative had offered to lend us a plot of land for a year to build our house on. 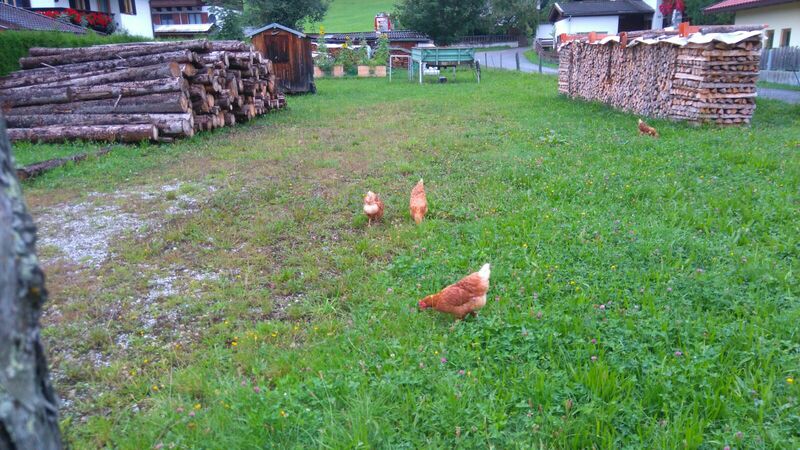 needless to say, we were totally freaking out about having found a temporary home for our house, especially since it’s only 5 minutes away from my parent’s place (where we have been invited to stay during the build) and features nothing but sustainably sourced wood and a chicken coop. during this process of planning our ‘tiny haus’ we have already met such lovely people, who have been so kind to us and are supporting us in so many ways on this adventure – and we are so grateful for it! nothing more to add, the happy chicken say it all! after a short vacation we arrived back in the netherlands this week, full of new energy and ideas. a while ago, we spotted a very active tiny house blog called marjolein in het klein, which follows a dutch lady’s construction of her first tiny house. needless to say, we immediately got in touch with marjolein and arranged a meeting to discuss our individual tiny projects. when we met her this saturday in a lovely little cafe in alkmaar, we immediately fell in love with her enthusiasm, spirit and ideas. the funny thing about our first encounter (of surely many more to come) was that we soon realised that our tiny house visions were not only similar but almost identical. not only did marjolein have a very similar design in mind, but she’s also planning on installing the exact same types of appliances in her tiny home, such as rain water collection, solar panels, an instant hot water heater or a wood oven. apart from finding out about the similarities in our planning, she also provided us with lots of new ideas and inspirations for our build that we had never considered before (a reading corner in the unused storage loft? ingenious!). in addition to that, marjolein supplied us with new leads on our path to finding a reasonably priced, sturdy trailer, which gives us hope that we might not have to spend 6000+ euros on it after all. for all the above reasons, we are incredibly happy to have met marjolein, not just a fellow tiny house enthusiast, but already a friend! 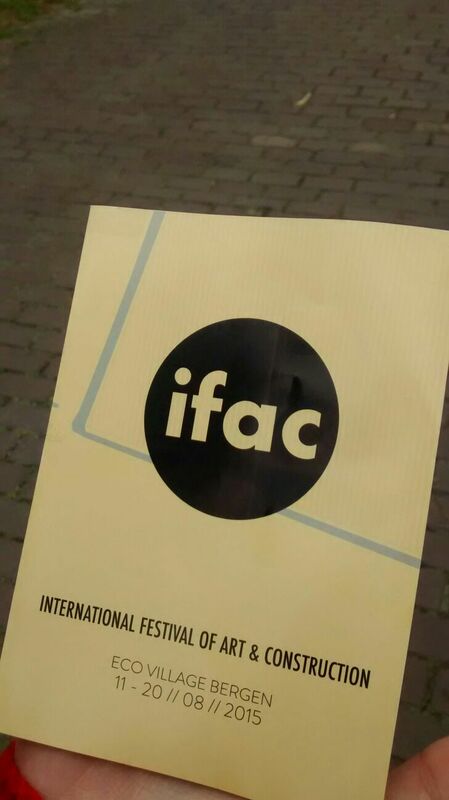 as we were about to part ways, she told us about ifac, the international festival of art and construction, which she had visited just the day before. since it took place nearby, we rented two bikes and made our way to the lovely eco village ecodorp bergen, which provided the venue for this creative gathering. admittedly, we knew nothing about the festival itself, apart from that it would feature ecological and sustainable architecture and might inspire us and our ‘tiny haus’ build. when we entered the gates of the eco village, we had no idea that we were about to be swept off our feet. while walking through sustainable art installations and buildings made of straw, clay and wood, through crowds of creative people that spread positivity and joy everywhere, we suddenly spotted a relatively large wooden structure in an open warehouse. at first sight, it looked like a small house, with a gabled roof, it was built on a trailer frame – could it be? yes! we had found a tiny house!!! totally ecstatic and excited, we tried locating the person who was building it and not only did we find leon, a super friendly eco village inhabitant who was constructing the tiny house as a movable living space within the village, but he was also willing to give us a tour of it and answer a few of the hundreds of questions racing through our minds. just as for us, it is the first tiny house project leon has ever tackled and therefore he was able to give us first-class advice, guide us through many different stages of his build and tell us about some of his mistakes and pitfalls. funnily enough, just as with marjolein, leon’s tiny house has a very similar layout to ours and therefore it was absolutely amazing for us to see some of our own concepts and shapes come to life and get a feeling for the size of the structure. apart from maxing out the height and width (as with most builds), this tiny house is 7.5 m long, which means that it’s 1 m longer than our ‘tiny haus’. standing inside of it, we immediately realised how incredibly spacious it was, which made any previous fears of claustrophobia simply fly out of one of the many windows. however, seeing that our house would offer an entire meter (yes, in tiny house terms that’s a lot!) less floor space, it got us thinking about the old topic again: space vs. weight. although we had previously decided to lose a few centimeters on the inside rather than failing to stay under our weight limit of 3.5 tons, leon’s super-light wall constructions and weight-saving ideas made us reconsider whether we should not add some extra floor space to our house after all. also, the fact that leon wants to use as many sustainable, recycled and ecological materials as possible opened our eyes to new choices of materials that we hadn’t previously thought of. after we were finished bombarding leon with questions, we agreed to stay in touch and keep following each other’s progress, had some wonderful veggie pasta, watched an interesting presentation on natural rocket mass heaters and made our way home. today, our heads are still buzzing from all the new input we received from our new tiny house friends and we can’t wait to apply some of the ideas to our ‘tiny haus adventure’. 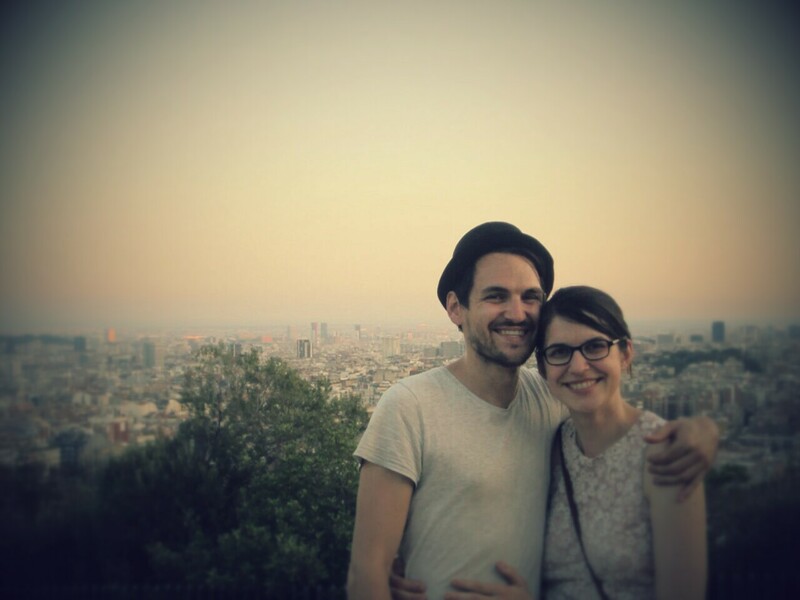 thanks so much to marjolein and leon for their incredible inspiration, we can’t wait to follow up with them and see how all of our projects are slowly forming and growing. from the very first moment that we started researching the possibiliy of building a tiny house in europe, we realised that weight would always be an issue. in stark contrast to the birthplace of tiny houses, america, where gigantic cars which could tow entire fleets of tiny houses roam the streets, size and weight restrictions of trailers pose severe restrictions to prospective tiny house builders in europe. while constructing a tiny house within these size restrictions is not a problem, what matters is the 3.5 tons weight limit of car-towed trailers. basically, this leaves us european ‘tiny hausers’ with two options: to either use a more heavy duty trailer that can only be pulled by a lorry, or to trim down a tiny house to its lowest possible weight in order to be able to tow it with a conventional car. as the prospect of an expensive lorry driver’s licence, in combination with the inconvenience and costs of renting (or god forbid, buying) a lorry didn’t appeal to us, we decided to accept the challenge and build a super-light home. at this point in time, it is still very hard to predict how severe our struggles with weight will be. what we do know is that the average american tiny house is considerably heavier than 3.5 tons and that european tiny house pioneers, such as hanspeter brunner (http://www.black-forest-tiny-house.com) or klaus toczek (http://www.toczek.name) both address weight as one of the key issue when planning their projects. for these reasons, maria and I have decided to also make weight a central focus of our build and keep it in mind with every component of the house. therefore, we are meticulously finding ways to save a few kilograms wherever we can, be it a tiny and light wood oven (this one is absolutely awesome: http://salamanderstoves.com/the-hobbit-stove), lighter construction wood or less heavy roofing options. in addition, we will weigh each relevant part that goes into the construction individually before starting the actual assembly, so there won’t be any unpleasant surprises when we want to hit the road. the fact that we are so aware of potential weight problems will hopefully leave us with a few kilograms to spare in the end, which we can use for actual furniture, appliances, water tanks, etc. and won’t force us to pack up our entire belongings whenever we want to change the scenery and move our ‘tiny haus’ some place else. today marks a very exciting day for me and maria. long before we’d decided to build a tiny house, we already realised that, like many people today, we possessed too much stuff. for me, the idea of being able to pack your entire belongings into a backpack and hop on a train/bus/airplane has always had something very liberating. however, as we settle down in places (even if just temporarily), we tend to accumulate more and more things that can tie us down emotionally. all of a sudden, it appears that even though I haven’t worn this sweater in 2 years, I would never be able to live without it, the same goes for that dress, pair of shoes or holiday souvenir. on our path to living consciously and in appreciation of our material possessions, we realised that we wanted to radically downsize – not just for practical reasons in the ‘tiny haus’ but also to free ourselves from too many material ties. 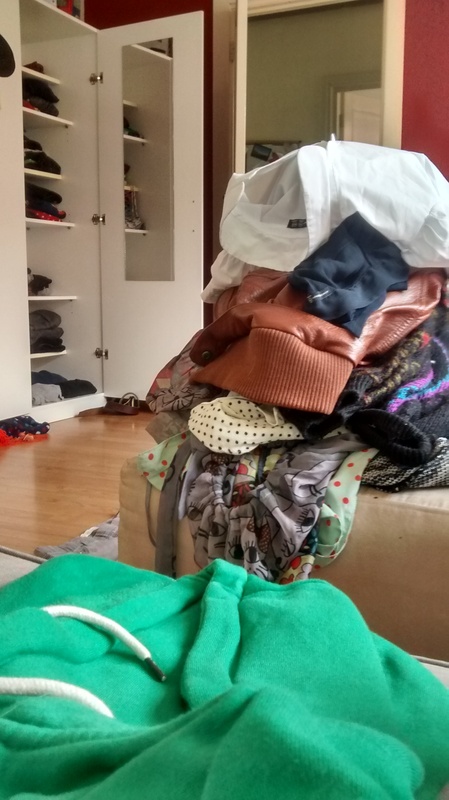 for this reason, we have been gradually giving away clothes, furniture and other things by creating a ‘free-shop, freecycle, sharing’ facebook page called “leiden for free”, which promotes the moneyless exchange of goods and aims at bringing together people who want to make others happy with stuff they have no real use for anymore. 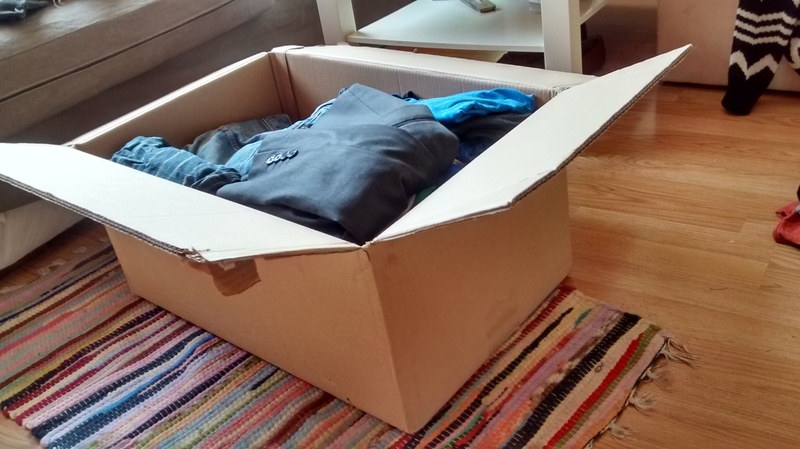 today, however, we decided to take a more radical step in downsizing our wardrobes: maria and bernie’s liberation giveaway. the basic rule for this mission is: if you haven’t worn it at any point last year – it’s gonna go. getting stuff in order, 1-2, 1-2, the dream for any austrian/german! as we will be living in austria, where the winters can be 6 months long and quite harsh, I will of course keep a sturdy winter coat, some thick socks and thermal underwear in order to be prepared for everything the alpine climate can throw at us. also, for practical reasons, I kept one full set of cycling/running gear, a full suit, one shirt and a black tie so I don’t have to go shopping when attending a wedding/funeral/job interview. 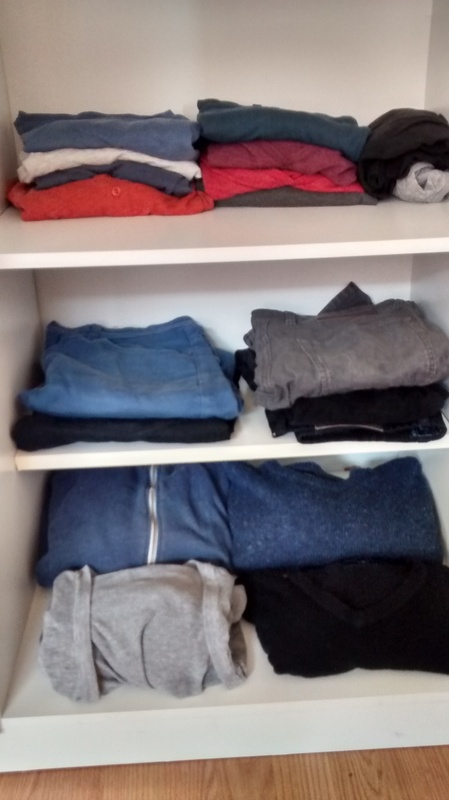 just a second ago, we had some people come over and pick up most of the clothes and now we feel absolutely great about it and can start planning how we’re going to use the extra space. a few more downsizing rounds likes this, and we will be ready to move into our ‘tiny haus’ in no time! we are maria and bernie and this blog will follow the planning and construction of our ‘tiny haus’. the idea of living small, or even tiny, has been on our minds for some time and this year we decided that we want to create this blog in order to document our progress and create a database for others who also pursue the dream of living small, sustainably and free. so, how did the idea of building a tiny house come about? the matter of fact was that we didn’t have enough time because we spent too much time at work and, as a result, were usually mentally or physically exhausted on the weekends. but what could we do about that? after all, we needed the money to pay for our daily expenses. 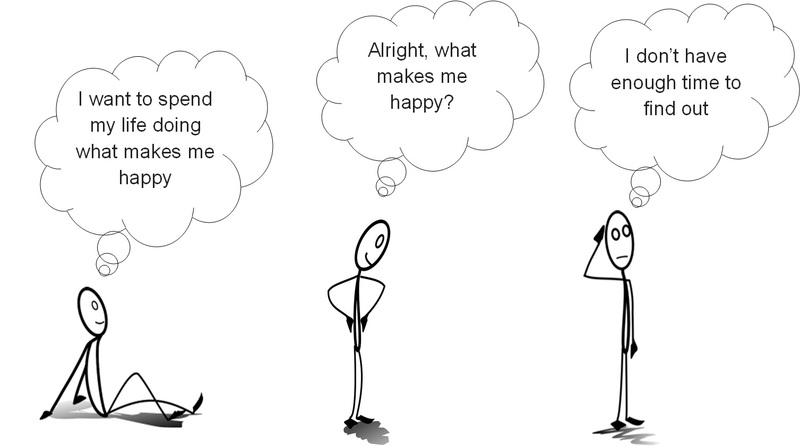 at this point we were faced with a basic decision: we could either find a more effective way to make the money we needed to pay for “life” or overthink our expenses. since, as graduates in russian and linguistics, the only ways of earning decent amounts of money in a short timespan that we knew would sooner or later either get us into a mental hospital or prison, we decided to go for the latter option and deconstruct our daily, weekly, monthly and annual expenses. in this process, we soon realised that we had already been living quite economically, we didn’t really buy new clothes, fancy electronics or indulge in any expensive hobbies – so why was it not enough? the answer was simple, really: rent. each year we paid thousands of euros/pounds into a rental system that would simply ‘endure’ us, but could kick us to the curb at any moment. however, living in 21st century western europe, the alternatives to renting for a ‘young professional’ were practically non-existent, and one thing we definitely didn’t want was to work full-time for 10 years just to be eligible for a huge bank loan that would leave us indebted to a modern banking system that we did not agree with. at this point we realised that if we wanted to stop paying into the black hole that is our renting system, we would have to think outside the box and get creative. this was the time when we came across the american tiny house movement, which we immediately fell in love with. the idea of living in a space we designed and built ourselves, paired with financial and personal freedom and flexibility would not only free us from the rent trap but also provide us with an amazing project we could really sink our teeth into. hundreds of hours of videos and blogs by wonderful ‘tiny housers’ later, we decided that we definitely wanted the future of our living arrangement to be ‘tiny’ and build our own little home on wheels. regarding the construction of a tiny house in europe, one thing that has to be taken into consideration is that the american bureaucratic framework featured in instructional videos and tiny house plans differs from european building standards. especially when it comes to trailer weights and dimensions, european laws impinge on existing american tiny houses and therefore call for an adaptation. for this reason, our aim with this project is to capture each step in the process of researching, planning and constructing a european tiny house in order to create a manual for other people who also dream of living tiny. 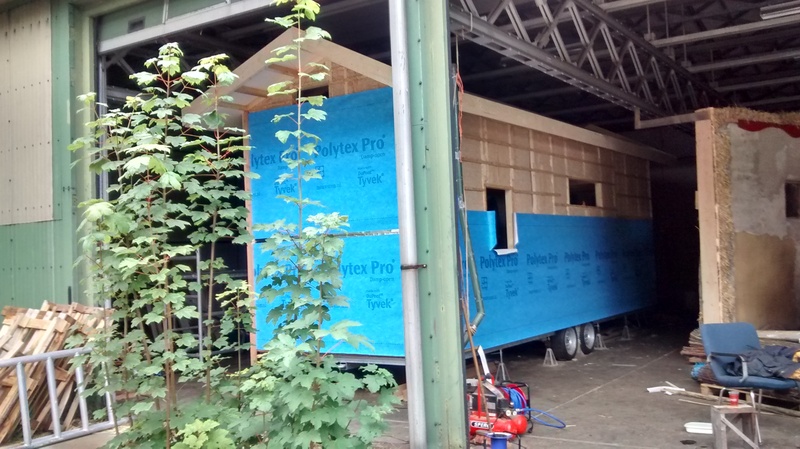 at the moment, we are about half a year into the concrete planning of our house, we spoke to trailer suppliers, carpenters and other people who are working on establishing a tiny house culture in europe. we are already very happy with our basic house design, which we created using google sketchup. also, we have found a small local trailer company that we think will build the ideal trailer for our home and we started getting in offers for building materials. our next step will be to buy a proper video camera and get aquainted with it, so we can actually manoveur a camera properly by the time the actual construction of the house will start. some more information about us: both born in 1988, maria (slovak) and I (austrian) have no prior experience in constructing a house. even though I spend a few summers working on construction sites, the closest we ever got to building to a home was making flower pots from pallet wood for our little urban garden. however, we are convinced that with a lot of research and help from friends, we’ll be able to make this happen and show others that anyone can build a home if they really put their minds to it. 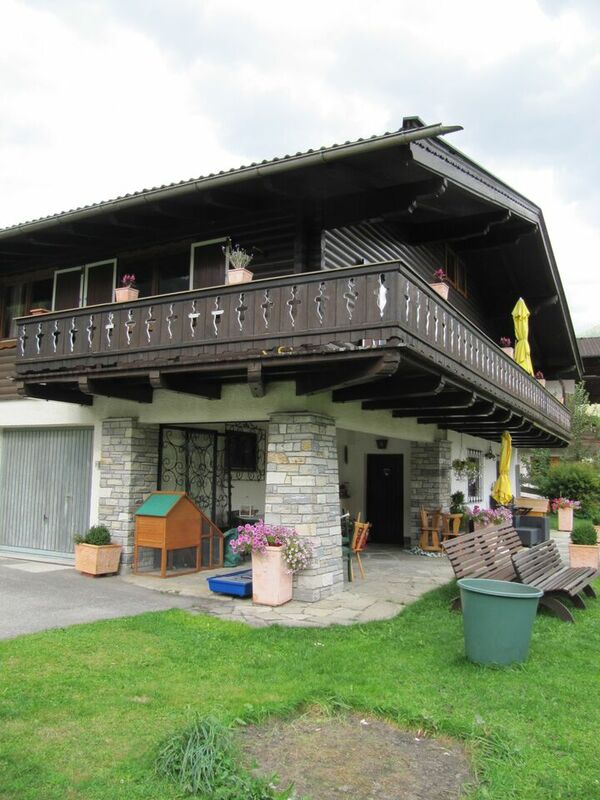 we are currently living in the netherlands; however, we plan on building our ‘tiny haus’ on the countryside of austria, where we will be able to live with my parents and get help from my dad, who built his own house about 40 years ago. apart from building the actual house, we are also super interested in basically all sustainability movements and alternative ways of consumption, we are currently exploring vegan cuisine on a molecular level and we’ve basically been living without consuming plastic for the last half year. this blog will therefore not only be restricted to our ‘tiny haus’ but also feature the occasional articles and segments on gardening, diy furniture, tasty vegan recipes and much more. we are very excited and can’t wait to take you with us on this awesome journey.